Left to right: Kiyoshi Okuno, JAEA and Technical Responsible Officer for the toroidal field conductor Procurement Arrangement; Arnaud Devred, Leader of the Superconducting Systems & Auxiliaries Section; Ina Backbier, Procurement Responsible Officer; and Neil Mitchell, Head of the ITER Magnet Division. The heart of the ITER Tokamak is the toroidal field magnet system made up of 18 superconducting coils. 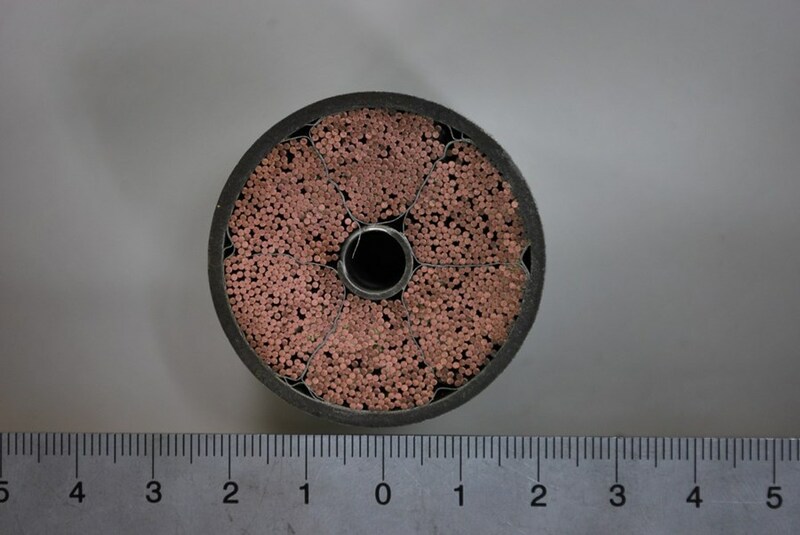 Each coil is wound from cable-in-conduit (CICC) conductor, which consists of 900 niobium-tin-based superconducting strands (Nb3Sn) mixed with 522 pure copper strands and formed into a rope-like cable that is inserted into a circular stainless steel jacket. The conductors, cooled by a forced flow of critical helium, are designed to transport 68 kA in a peak field of 11.8 T.
In total, the toroidal field coils require 88 km of conductors whose in-kind procurement is shared among six Domestic Agencies—China, Europe, Japan, Korea, the Russian Federation and the US. Japan was the first Domestic Agency to sign a Procurement Arrangement with ITER Organization on 28 November 2007, for its 25-percent share of toroidal field conductor. In March 2009, it was reported in Newsline that Japan had completed the production of its first batch of Nb3Sn-based superconducting strands; last April, it was reported that Japan had completed the manufacture of its first conductor unit lengths to be used for toroidal field coil trial winding. On 20 June 2010, the ITER Organization approved a credit request submitted by the Japanese Domestic Agency for a total amount of 7.82 kIUA (ITER Units of Account), corresponding to EUR 12.14 million. Each toroidal field coil is wound from cable-in-conduit conductors which consist of 900 Nb3Sn-based superconducting strands mixed with 522 pure copper strands. In total, the toroidal field coils will require 88 km of conductor. The credit request encompasses the order of 17 tonnes of Nb3Sn-based strands, 2.4 km of superconducting cables and one 760 metre-long copper dummy conductor. This material, produced by Japanese suppliers selected by the Japanese Domestic Agency, has successfully undergone all required quality control tests. The results of these tests were inputted by the suppliers into the Conductor Database developed by the ITER Organization, and were verified and cleared at regular intervals by the Domestic Agency and ITER according to the control points defined in the Procurement Arrangement. In total, the acceptance of this material required the clearance of 318 authorization-to-proceed points by the Japanese Domestic Agency (308 for strands and 10 for cables) and one conductor hold point by the ITER Organization. This credit request is the first for actual hardware being produced within the framework of industrial contracts for ITER and that will be used for components installed in the Tokamak. It confirms the leading role played by Japan in ITER conductor production. It is also a good example of how tight collaboration between personnel at the ITER Organization and the Domestic Agencies can drive the project and lead to significant accomplishments.